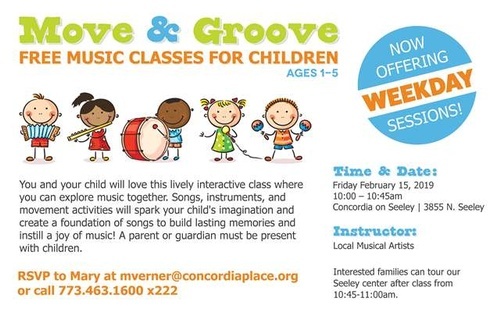 You and your child will love this lively interactive class where you can explore music together. Songs, instruments, and movement activities will spark your child's imagination and create a foundation of songs to build lasting memories and instill a joy of music! A parent or guardian must be present with children. RSVP to Mary at mverner@concordiaplace.org or call 773.463.1600 x222 Interested families can tour our Seeley center after class from 10:45 - 11 AM.